After The Trial, this was next on my list of movies in my collection with the longest gap since the previous viewing (I need a shorter way of saying that). It had been nearly seven years. Again, I was hoping for a Blu-Ray, as the DVDs that Facets put out leave much to desired. But there was also the more obvious impediment to a revisit: the time commitment. It’s hard enough to find a 7+ hour block of free time, never mind devoting that block to the viewing of a single film. I ended up having to split it, watching the first two-thirds on Wednesday night and the remainder on this Saturday morning/afternoon. I don’t recommend this… the movie’s tango-esque back-and-forth in time narrative structure makes it more rewarding to watch in a single session, or at least a single day. 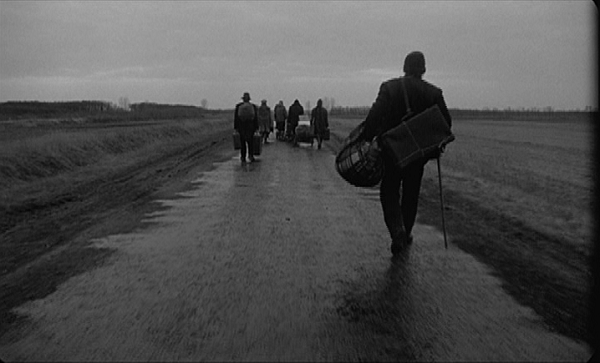 Bela Tarr’s work also has a mesmerizing quality that is less effective when you break the spell. I won’t be saying much about how amazing this movie is. In my first review, I praised the film’s virtues (including “populated with characters whose faces are landscapes and landscapes whose faces have character”, a line I’m rather proud of) in a rambling paragraph. There are more virtues I could write about… the way the camera itself does a tango in the central, iconic dance scene; the masterful manipulations of Irimias; the see-sawing score by Mihaly Vig, used sparingly. There is much greatness here. I had the movie on my top 100 list, but I finally removed it last year because so much time had passed without me revisiting it. Actually, there are a good dozen or so films in my top 100 that I haven’t watched for 5+ years, but this was the only one of those that I’d only seen once. This entry was posted on March 7, 2015 at 2:56 pm	and is filed under Movie Reviews. You can follow any responses to this entry through the RSS 2.0 feed. You can leave a response, or trackback from your own site. (Spoilers) Such a fascinating film, and one I hope to see again (especially if a superior DVD ever becomes available). My one issue with it (and this may have been exacerbated by my splitting the film into several sittings, some of them late at night) was that I never really grasped just what Irimias was up to. I get that he rooked the villagers in some form, and I assume they were delivered into the hands of the authorities in one way or another, but exactly what happened was not clear to me. That said, I found Tarr’s painstaking tableaux and perfectly orchestrated long takes utterly enthralling to watch, and if I didn’t totally comprehend the plot, the atmosphere came through undiminished. Irimias’s plan is a little hard to grasp, especially because of that scene where he’s trying to buy explosives. But the gist of it comes through, and the overall idea of betrayal under an authoritarian regime.